Born in Brooklyn, hailing from Hempstead, HUS KINGPIN launched his rap career internationally on Tokyo label Goon Trax. 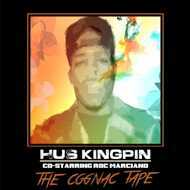 Able to meld jazzy production with the gutter vocals, the international Hus Kingpin returns to the US for his stateside Mello Music Group introduction “The Cognac Tape” hosted by and featuring legendary Hempstead emcee Roc Marciano along with Hus’ crew Smoovth, Rozewood and Marvelous Mag, not to mention production from heavyweight production team The Snowgoons. Nasty, haunting production drives smokey vocals and precise defiant, bravado laced lyricism. This is that something to twist a dutch to while sippin’ that Louis XIII.